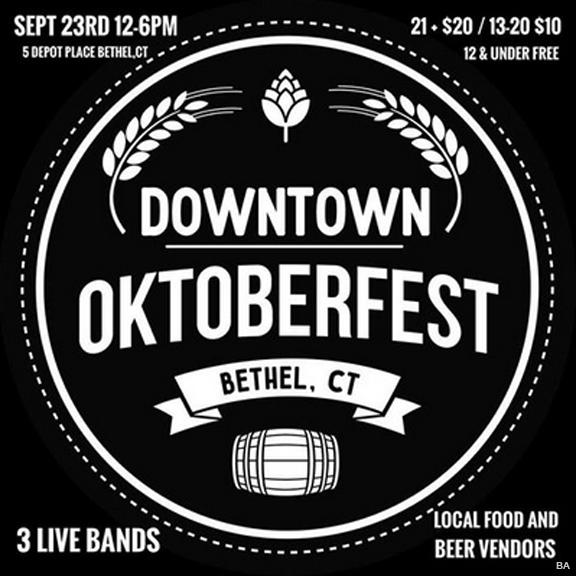 Come on down for the First Bethel Downtown Oktoberfest! Hosted by Broken Symmetry Gastro Brewery, ECCO Rooftop Eatery and Bar at La Zingara, J. Lawrence Downtown, Taproot Restaurant, La Zingara. Corn hole tournaments and Masskrugstemmen (steinholding) contests. Parking available at the train station and back parking lot of municipal center with trolley rides running from 11:45-6:30. Ticket Prices: $20 ages 21 & Over / $10 ages 13-20 / Free for ages 12 and under. Cash only. ATMs locations close by. Feel free to email lisa@brokensymmetrybrew.com with any questions or call any of the participating restaurants. We are a Brewpub located in the historic train station in Bethel, CT. We brew a wide range of styles to provide an ever-changing variety for our customers to enjoy. We also have a full kitchen specializing in San Diego style cuisine. A casual , comfortable, vibrant atmosphere where people gather to enjoy food and drink. ECCO: The best Connecticut has to offer in craft beer, cocktails, and wood-fired delectables. Located in Bethel above La Zingara Ristorante. Serving regional Italian cuisine in the heart of downtown Bethel, CT. Zagat’s rated in the top 1,000 Italian restaurants in America. New York Times rated Very Good.